William W. Li, MD, is an internationally renowned Harvard-trained medical doctor, researcher, and president and a founder of the Angiogenesis Foundation. His groundbreaking work has impacted more than 70 diseases including cancer, diabetes, blindness, heart disease, and obesity. His TED Talk, "Can We Eat to Starve Cancer?" has garnered more than 11 million views, and he has appeared on The Dr. Oz Show, Martha Stewart Live, CNN, MSNBC, NPR, Voice of America, and has presented at the Vatican's Unite to Cure conference. 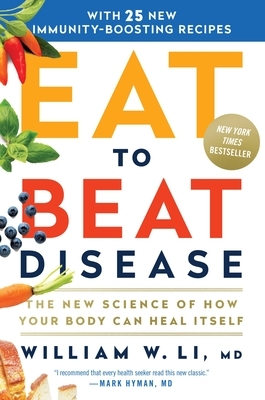 "Among the many diet and health books of recent years, this book should top the list. Dr. William Li, an experienced internal medicine physician, also has an outstanding professional reputation in medical research. He knows science and how to present it to the public. His facts can only lead to a more fulfilling way to think about health for all of us."